A fire alarm is just a fire alarm isn’t it? Think again. We are proud to be technical partners with Siemens and their BT Products division. As a result, this means our company has had the full sales, installation and maintenance training on the Siemens CerberusPRO Fire Detection System. Widely regarded as the most advanced fire alarm system in the world. Due to the incredible ‘ASA Technology’ of their detectors, the system can recognise up to 5,000 different false alarm scenarios. In simple terms, it can tell the difference between lightly burnt toast – and a genuine fire. Contact us today to find out how we can eliminate false fire alarm activations for your School, Hospital, Nursing Home, Business …..
ASA Technology Detectors (ASA=Advanced Signal Analysis) will Eliminate False Alarms for all types of applications. Our ASA neural fire detector OOH740 and ASA neural fire and CO detector OOHC740, offers your customers optimal protection for every application – from data centers (high value area, clean environments requiring sensitive detection) to industrial production facilities (which can be harsh, dusty environments, requiring robust smoke detection). The Siemens neural fire detectors are the most advanced fire detectors in the world. With its patented design, you can rest assured that this is the most powerful and intelligent fire detector in the world. The CerberusPRO Neural Smoke Detector with ASA technology passes the Queensland Fire Brigade cooking and shower pragmatic fire test. These test InterActive conducted with QFRS, Siemens and OMNII Fire Engineers over a 2 day period at the Quest Apartments site at Breakfast Creek, the system proved its reliability and immunity against False Alarms from deceptive phenomena. 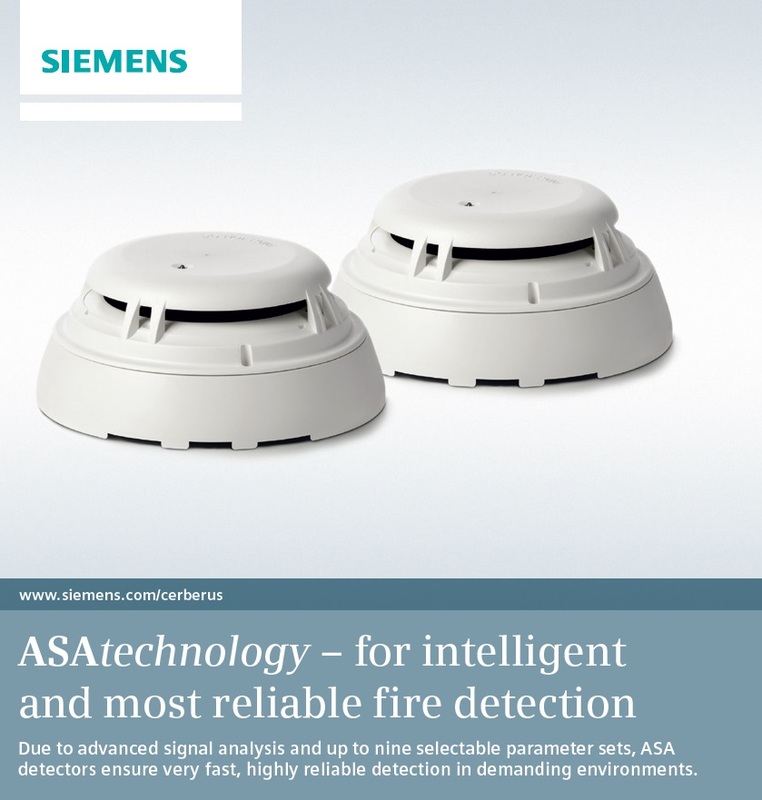 Other fire brigades from all around the world have also realised the advantage the Siemens ASA Technology can offer, follow this link to Read more from a UK Fire Magazine. As a solutions partner of Siemens BT Products you can be guaranteed of the knowledge of 160 years of research and development by the largest building technologies company in the world. Perfect dynamic adjustment to current event in diverse environments – from sensitive to harsh. Depending on their location, fire detectors are exposed to diverse environmental factors. Typical environment factors include cold, moisture, dirt or electromagnetic fields. They can have an effect on fire detection and even trigger a false alarm. A fire detector, however, must guarantee reliable detection, despite environmental factors. Intelligent fire detectors must be able to differentiate between deceptive and actual fire phenomena. Your competent partner for intelligent fire safety.